Fresh asparagus is wrapped in thin slices of prosciutto, roasted to perfection and then topped with crumbed feta cheese. 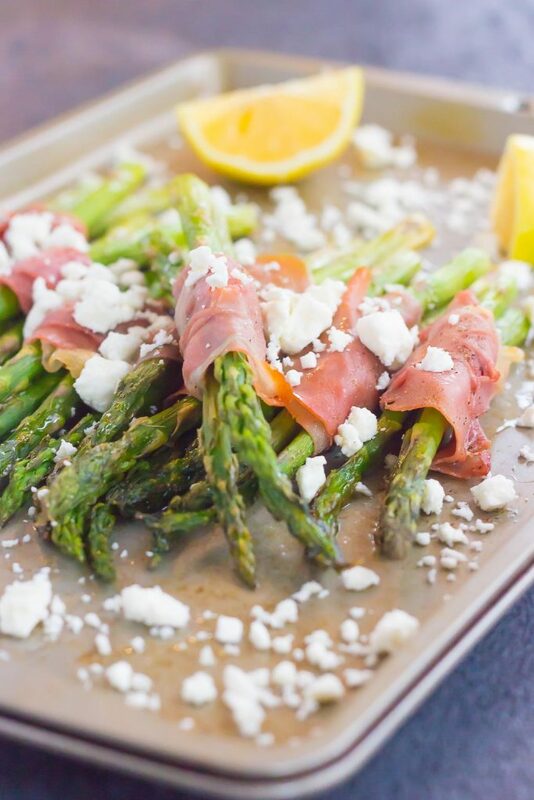 Salty, crispy and packed with flavor, this Prosciutto Wrapped Asparagus with Feta makes an easy and delicious side dish! Quick! Name your favorite vegetable! If you said asparagus, then I’ve got a delicious recipe for you today! I’d have to say that my favorite veggies are asparagus and mushrooms. Actually, if I’m being brutally honest, mushrooms come first, followed veeery closely by asparagus. And then broccoli, potatoes, corn, and so on. I’m not really picky when it comes to veggies, but I have an extreme love for the first two that I mentioned. And it just so happens that the hubster loves asparagus too, so we eat a lot of that in our house. And that’s just fine by me! Since we eat it quite often, I’m always testing out new ways to prepare it. 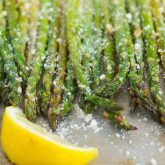 From this Roasted Lemon Parmesan Asparagus, to the simple roasted kind, I love it all. But, after making this Prosciutto Wrapped Asparagus with Feta, I think I may have just found my new favorite way to eat it. There’s just something about prosciutto that makes it soooo good. It’s a meat that I hardly ever have, but when I do, I silently vow to eat it more. On sandwiches? It’s the best! 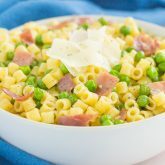 In pasta? Give me some more! And wrapped around tender asapargus? Well that’s a winner for me. And you, too, if you love prosciutto. And then comes the feta. Oh how I love feta. 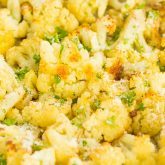 It’s savory, crumbly, and goes well with just about anything. Especially with asparagus and salty prosciutto. It definitely gives this veggie the perfect touch. And like most of my recipes, this Prosciutto Wrapped Asparagus with Feta takes about 5 minutes of prep time and about 10 minutes to roast in the oven. What could be easier than that? So, if you’re on the hunt for a tasty new side dish, or even an easy appetizer, then you’ve come to the right place. 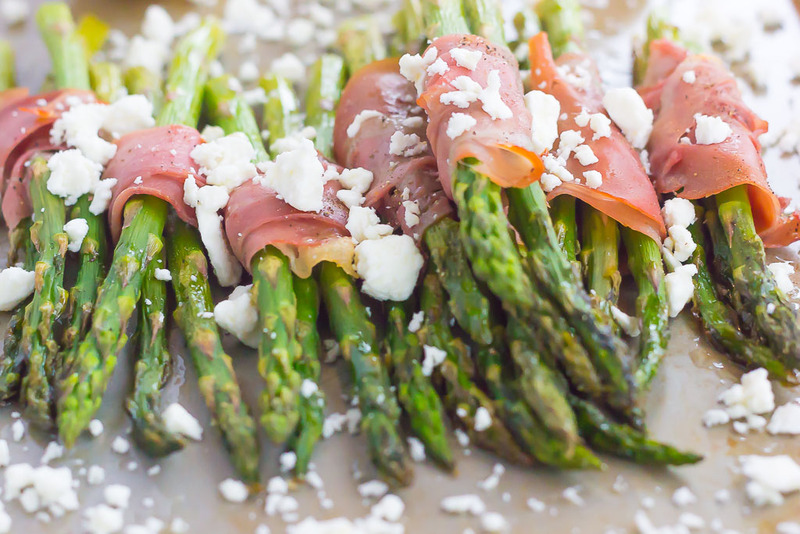 This Prosciutto Wrapped Asparagus is savory, crispy and oh-so good! Preheat oven to 425F. Lightly grease a large baking pan with non-stick cooking spray or line with parchment paper. Set aside. Take 3 spears of asparagus and wrap with one slice of prosciutto. Repeat with remaining spears. Place onto prepared baking pan. Drizzle asparagus evenly with olive oil and then season with salt and pepper. Bake for 8-10 minutes, or until asparagus is crisp. Remove from oven and allow to cool for 5 minutes. Then, top with feta. So many great flavors in one little package. This would be a perfect side dish for a dinner party because it's easy, but it looks fancy! Now this is the way to do asparagus! This looks SO easy to throw together, yet it's still so elegant and pretty at the same time! This would be so good alongside a beef roast! Thank you, Sarah! I love you idea of pairing it alongside a beef roast...that does sound delicious! Oh gawsh, my favorite vegetable?! That's like asking me to pick my favorite dog. I can't! I love them all. ;) And I definitely love asparagus, although I hated it when I was younger. 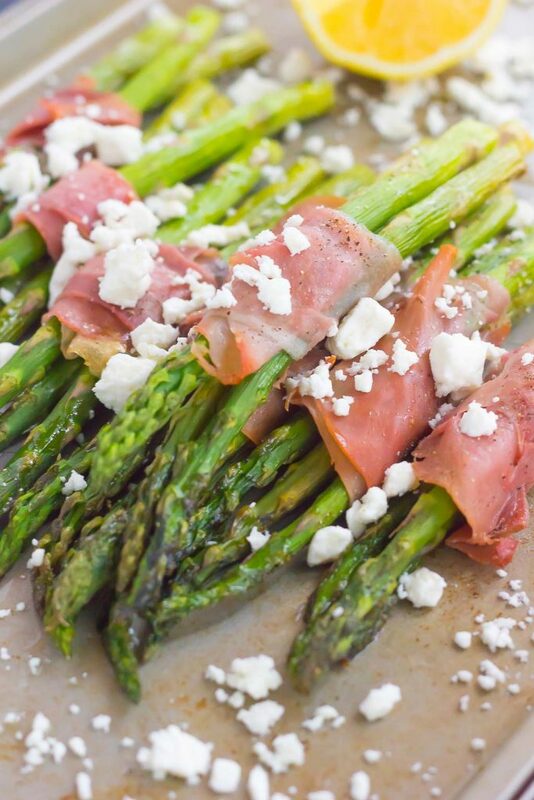 Prosciutto wrapped asparagus is one of my favorite appetizers or sides and I LOVE that you jazzed it up with the feta!! Such a delicious addition, Gayle! I could totally eat my weight with these wrapped, stalky beauties! Pinned of course! Cheers, girlfriend! Haha veggies are hard to pick a favorite, especially if you're not picky! :) Thanks for the asparagus love and pin, Cheyanne! Oh gosh...I can't say I have a favorite; it definitely depends on the day...and my mood! hahaha! But asparagus is absolutely in the mix - especially when it's coupled with prosciuto and feta!! Pinned! It is so hard to pick a favorite! Thanks for the kind words and pin, Annie! Haha I'm totally wishing it was spring, too! Thanks, Ashley! My favourite veggie? That's so hard and depending on when you ask me, my answer could vary. I love 'em all!! Asparagus would definitely be at the tip top of the list, though, especially when you add feta and prosciutto. Love that it is so quick to prepare, but still looks super fancy and so perfect when you have guests over....or even better as part of a random weeknight dinner. Pinned, of course. Hope you have a fabulous week, my friend! I love ALL the veggies too, though asparagus definitely ranks in the top two! Thanks for the asparagus love and pin, Dawn! Thanks, Kate! Asparagus is just so good! This is such a creative way to prepare asparagus! Love it! They are definitely my favorite veggie, although I almost always grill or roast them! Trying this recipe soon! Thanks, Mira! I've never grilled asparagus before...I will have to try that! Asparagus IS my favorite vegetable, and I've been known to eat an entire bunch myself off the sheet pan when I roast it. It's in everything when it's in season! I would absolutely inhale these -- I love that you wrapped them in prosciutto and the feta is such a delicious touch! I'm with you, Marcie! I have to muster up ALL of my willpower not to eat asparagus from the pan. Thanks for the kind words! Oh I will have to try it wrapped with cream cheese...sounds delish! And yay for doing Whole30, I want to try that! Thanks for the asparagus love, friend! Thanks so much for the asparagus love, Demeter! I might just serve this the next time I have guests over. Hope you have a great week, too! 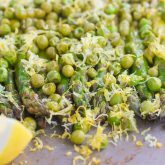 I LOVE so many veggies but Asparagus is definitely one of the top contenders! I can and have finished an entire tray of roasted asparagus by myself! I love that you wrapped them in prosciutto and the feta! Looks so yummy, Gayle! Thanks, Kelly! Isn't asparagus the best?! one of my absolute favorite things to eat! love love love prosciutto wrapped asparagus!! Beautiful! I'm not sure I can pick a favorite, but asparagus is at the top of the list. I love prosciutto with it, but I've never tried it with feta too. I'm absolutely going to try it! Thank you, Rachelle! The feta gives the asparagus the perfect touch! I didn't start eating asparagus until a few years ago but I love it so much now! I'm usually just boring and roast it with olive oil and salt, but I like your way much better! Especially with all that feta cheese! Oh no! Maybe the oven will be safer for your friend! :) Thanks for the asparagus love, Ashley! It's so hard for me to choose my favorite vegetable! Tomatoes would definitely be it, but since they aren't technically a vegetable... I'd have to say kale... but I really do love asparagus and also mushrooms. I just can't pick! Haha. Anyway, this asparagus looks amazing, Gayle! 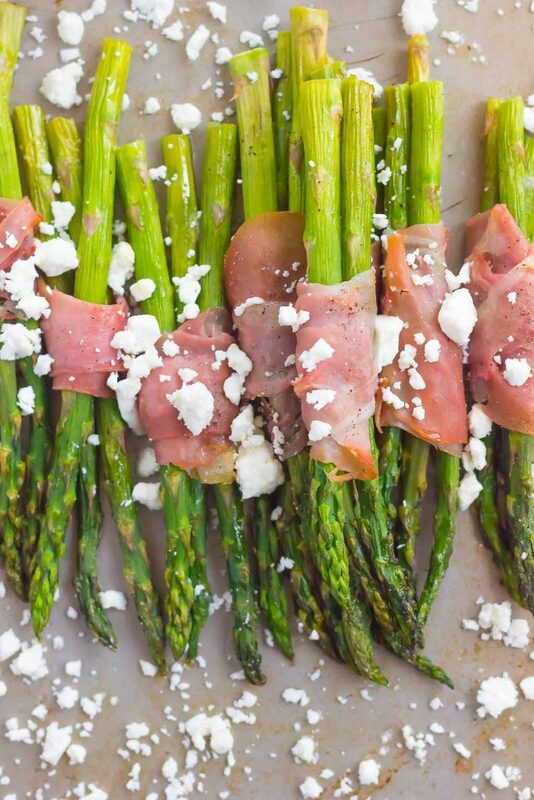 I love prosciutto and feta - I bet it goes perfectly with that asparagus. In fact, I can almost taste it.. my mouth is watering! I was thinking of tomatoes too, but I know they're a fruit, so I didn't want to confuse anyone! :) Thanks for the asparagus love, Keri! love asparagus too! this sounds like a wonderful side dish Gayle! I love how simple this dish is but how elegant it is for get togethers! I love prosciutto on sandwiches with some mustard and cheese slice! Oh man I LOVE these!! Prosciutto, asparagus, feta...all favorites. Gorgeous photos too, Gayle!